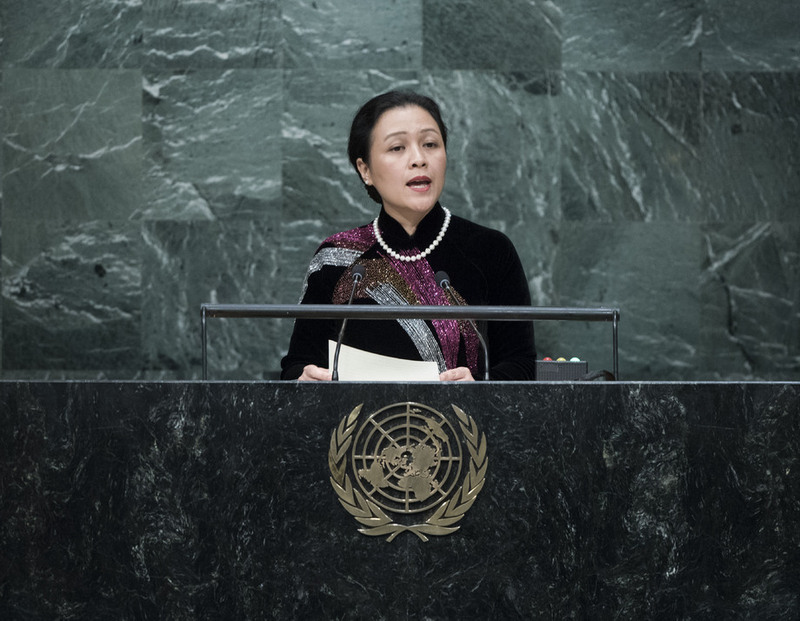 NGUYEN PHUONG NGA, Vice-Minister for Foreign Affairs of Viet Nam, said that, as a “beacon of hope”, the United Nations had played an increasingly important role in maintaining peace and security, protecting and promoting human rights and advancing development and progress. Welcoming progress on the Iranian nuclear issue, and in normalizing relations between the United States and Cuba, she nonetheless expressed concern that terrorism, violent extremism and religious and ethnic intolerance threatened regional and international peace and security. Among other challenges she addressed were poverty, discrimination, humanitarian crises and climate change, which threatened the livelihoods of billions of people and the existence of many countries. Experience with the Millennium Development Goals had shown that peace and stability were prerequisites for sustainable development. It was incumbent upon States to do their utmost to ensure peace and security at the national, regional and international levels. At the same time, people must be at the centre of the new 2030 Agenda. She called on developed countries to assist developing nations in the implementation of that Agenda, especially in the areas of financing, technology transfer and human resource development. She also supported South-South cooperation activities. Stressing that Viet Nam had immediately associated itself with the Organization’s values after it gained independence from almost a century of colonialism, she said it had always placed people at the centre of development. As part of the Association of Southeast Asian Nations (ASEAN), Viet Nam continued to work towards a thriving and stable region. It was vital that maritime safety, security and freedom of navigation and overflight in the South China Sea were secured. Viet Nam was working with ASEAN members to that end, including by calling on all parties to refrain from the threat or use of force and to settle all disputes by peaceful means in line with international law. It was also engaging with partners to ensure the implementation of the Declaration of Conduct of Parties in the South China Sea, and to work for the early conclusion of a code of conduct. NGUYEN PHUONG NGA, Vice Minister for Foreign Affairs of Viet Nam, said that, as a “beacon of hope”, the United Nations had played an increasingly important role in maintaining peace and security, protecting and promoting human rights and advancing development and progress. Welcoming progress on the Iranian nuclear issue, and in normalizing relations between the United States and Cuba, he nonetheless expressed concern that terrorism, violent extremism and religious and ethnic intolerance threatened regional and international peace and security. Among other challenges he addressed were poverty, discrimination, humanitarian crises and climate change, which threatened the livelihoods of billions of people and the existence of many countries. Experience with the Millennium Development Goals had shown that peace and stability were prerequisites for sustainable development. It was incumbent upon States to do their utmost to ensure peace and security at the national, regional and international levels. At the same time, people must be at the centre of the new 2030 Agenda. He called on developed countries to assist developing nations in the implementation of that Agenda, especially in the areas of financing, technology transfer and human resource development. He also supported South-South cooperation activities. Stressing that Viet Nam had immediately associated itself with the Organization’s values after it gained independence from almost a century of colonialism, he said it had always placed people at the centre of development. As part of the Association of South-East Asian Nations (ASEAN), Viet Nam continued to work towards a thriving and stable region. It was vital that maritime safety, security and freedom of navigation and overflight in the South China Sea were secured. Viet Nam was working with ASEAN members to that end, including by calling on all parties to refrain from the threat or use of force and to settle all disputes by peaceful means in line with international law. It was also engaging with partners to ensure the implementation of the Declaration of Conduct of Parties in the South China Sea, and to work for the early conclusion of a Code of Conduct.